I'm really looking forward to taking part in Amy's Great Cakes Soapworks challenges this year. This year she chose 4 techniques; Tiger Stripe, Elemental Swirl, Mica Swirl Tops and Leopard Spots. This 1st challenge, the tiger stripe, was very valuable for me. Not only because I learned a new technique but because I really had to stretch myself to figure out how to make this technique work. I quickly found out, with my first 2 attempts, that my basic recipe is a fast mover - which doesn’t normally bother me, as I’m used to working quickly and don’t think too much about it. You can see that the bottom started out correctly, the bottom 2 layers are striped! But then you can see that it got thicker and I ended up with a more layered look as I had to spoon the colors in. 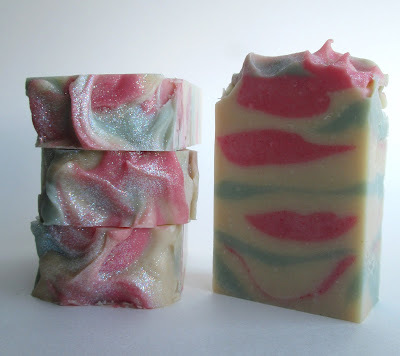 I’m not complaining about this soap, by the way, I still love the way it turned out! Nope. Still too thick. Good thing I needed to restock some soaps this week! I really loved this technique; it is definitely something I would do again! Looking forward to the trying the Elemental Swirl next week...thanks so much for hosting these challenges again Amy! Cee all 3 of your soaps are beautiful! I have never tried the tiger stripe but you have inspired me! Thanks so much Gloria, I hope you get a chance to try it! Those are all lovely, but your last tiger stripes are gorgeous!! I normally soap at higher lye concentrations, so I'm used to moving fast with my soap, too. 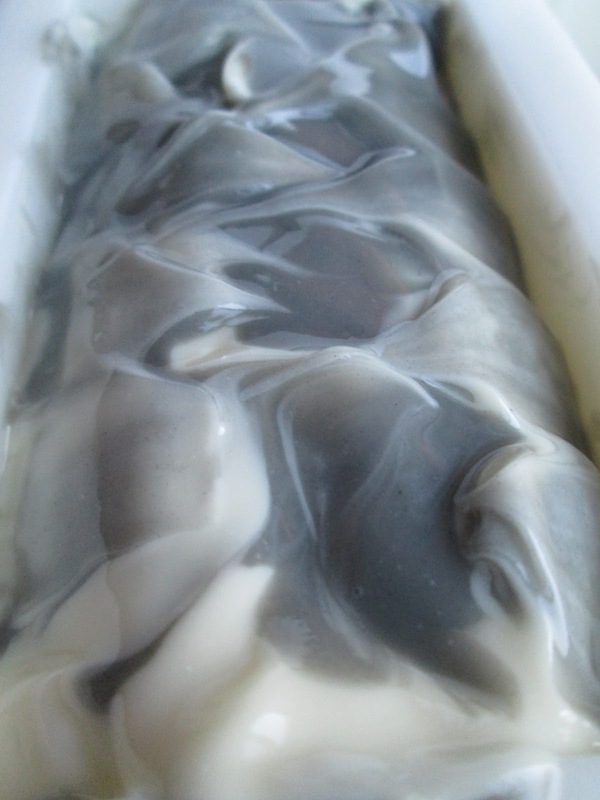 I dropped my lye concentration for my tiger stripe soap this week. All of yours came out great, but your 3rd attempt is striking! I like the colors and the variation in the stripes. What scents were your batches? Thanks DH! You reminded me that I also used a slightly lower lye concentration with this one too. The 1st soap is fragranced with Magnolia and Orange Blossom, 2nd one is Hawaiian Ginger, and the 3rd is Sandalwood. Oooooh! Very nice Cee! I love all of them! LOVE the Tiger Stripe. I also did one that I hope to post soon; except my colors did not come out too good. I really like yours! Congrats! Thanks Roxana...I can't wait to see yours! The third soap is amazing. 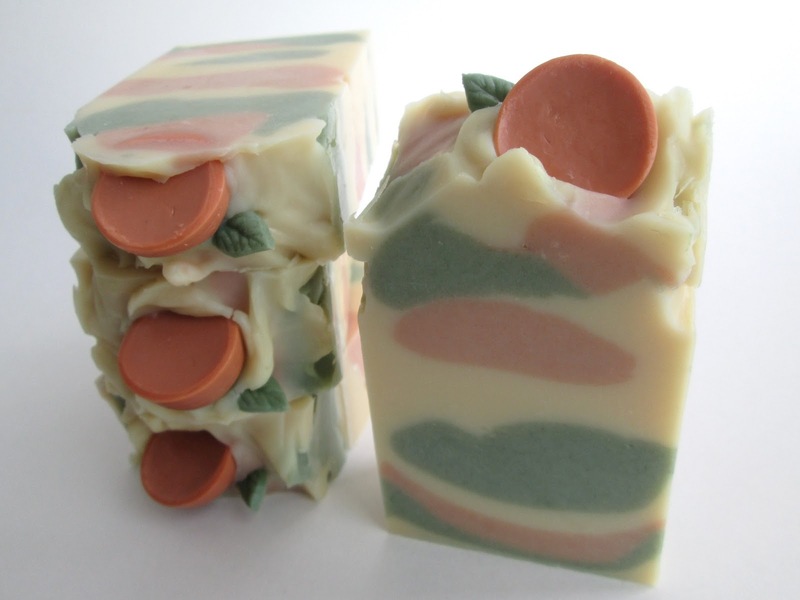 I had also problems with my soaps (I made two tiger stripe soaps), but it was a totally different problem than you had. I will write about it on Friday. Thank you Marika. I'm looking forward to your blog post, you have me curious now! Monica, you should give CP soap a try, you'd be hooked! I love making both kinds of soap. And you're right, ha ha...it totally looks like a pair of lips! Love the name, it's perfect! Wow, so beautiful, Cee! I like the top of your 1st trial and the colors are also very nice, but your last attemp is gorgeous! Thanks Nat, I'm really looking forward to seeing your soap for the challenge! Creo, que los tres estan estupendos!! They all are beautiful,but the last one is just perfect! I usually soap at room temperature,which,I think,allows me to play with a batter more and you can use sunflower oil,which is said to slow down the soap move. Also, f.o.-s have a great impact on moving,I have only two I can count on,when doing time-consuming projects. If you remember my 'Jungle Man',you will notice how tiny lines are and all that was due to well behaving f.o. I have envisioned my tiger soap for this challenge, but still haven't made it. Hope to soap tonight! Hi Maja, yes, I agree - I have a recipe that uses sunflower that is a slow tracer too. Are both your lye water and oils at room temp? I usually just have my oils at room temp and my lye water cooled for about 20 mins. I was drooling over your Jungle Man soap yesterday....it is a work of art, I absolutely love it! Can't wait to see your challenge soap! Thank you,dear,but actually, the thing is working with a reliable f.o. My oils are at 80-90 degrees (always closer to 80,if I substitute water with other liquid) and my L/W is around ,but always cooler than oils. That's the way I do,I'm not saying it has to be like that. I never gel my soaps,so never have overheating concern. All of them turned out gorgeous, Christine! The last one is striking, very beautiful! I had to go to Youtube to see how to do it, and now I kinda want to give it a try, lol. How did your last one unmold for you...was it really soft? Making a bastile batch is on my list too. Thanks Kalla, I hope you get a chance to try it! It definitely helped to use a slow tracing recipe with a lower lye discount, soaping cool and with a well-behaving f.o. As far as softness - it did unmold fine but it was definitely softer than normal; however, it's hard to compare because I didn't put sodium lactate in this batch. I would however expect this soap to be softer with that high % of soft oils, and in fact I could only cut one piece yesterday and will wait a couple of days before cutting the rest. It would be interesting to try it again with SL just to see the difference. I put 1% sodium lactate in my bastille soap, but it is still very soft. I thought it would be much harder. Maybe 1,5-2% SL would be better. That's good to know Marika, thank you! Lately, I've found that some of my soaps have been crumbly, so I've been leaving out the SL (I usually use 1% too) to see if that helps. I guess the magic number for SL would be different for each batch, depending on the percentage of hard and soft oils. All three soaps are gorgeous, Cee Gee! I love the cute embeds on the tops of the first soap, and the colors in the second one are great. That pink is so pretty! And your tiger stripe turned out great. I'm going to have to try that technique someday. I am always impresses with pastel colors of your soaps. I really admire your persistency to obtain the maximum from this technique! Grate job Cee! 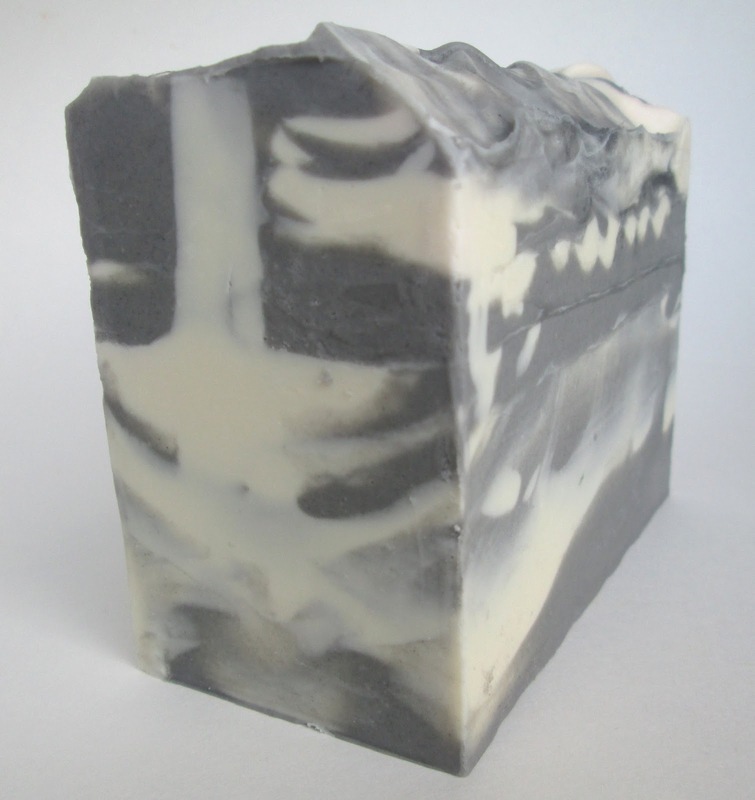 What a perfect tiger stripe soap! So thin and nice stripes, looks very real! Thanks ladies! Vivien - I was thinking it was more zebra too, lol! Can't wait to see what you come up with! You're doing such a great soap. You look wonderful. I wish you a happy Easter. I really appreciate it Doreen, I hope you have a wonderful Easter holiday too! They all look great! So glad you persisted in getting the look you were hoping for! :) You're probably going to want to hang on to that bastille recipe for the elemental swirl as well. Just sayin. Lol, I appreciate the heads-up Amy! Black and white is just so me. 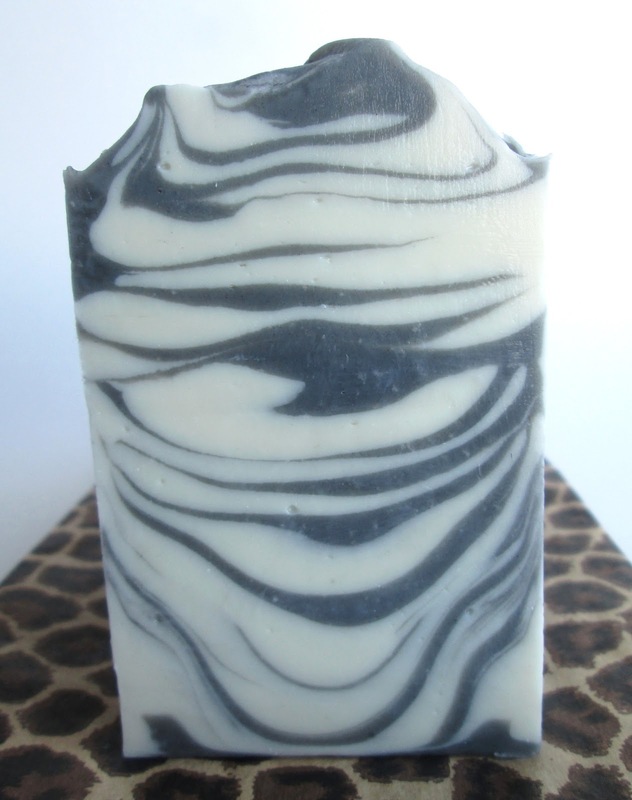 I love all things black and white including your soap! Came out great. Thank you Jennifer...I've always admired black and white soaps, and this was the perfect opportunity to try one! Some formulas and additives really do make this technique a challenge! Great sticking with it, the end result is totally enviable!! Thank you Kenna, I really appreciate it...I'm still in awe over your rainbow-striped tiger soap...wow! Thank you, I do like the spooning technique too...would work great for a camo soap! Love all three of them! All three of them came out gorgeous. Love black and white for this kind of swirl. Third time is a charm! Your other two are super cute too especially the first one with the embeds! Your soaps always come out so beautifully! If the third times the charm, maybe I need to get back in my own soap room and hope to be "distraction free" lol? Just in awe of how awesome your work is! Cee, beautiful soap, got a Q?, did you add Ti dioxide, how much?? Hi Lata, no, I don't think I added TD to this batch. When I use TD, I usually add up to about 1 or 2 tsp ppo. I am simply amazed by your patience to answer every single Q. Great job! 3 Studies REVEAL How Coconut Oil Kills Belly Fat. This means that you actually kill fat by eating coconut fat (in addition to coconut milk, coconut cream and coconut oil). These 3 studies from large medical magazines are sure to turn the conventional nutrition world upside down! BlueHost is one of the best web-hosting company with plans for any hosting needs.